We can help you to make better informed, more insightful recruitment and selection decisions. This means fewer unsuccessful appointments and reduced recruitment costs. Interviews are an essential part of the recruitment and selection process. They enable experience and knowledge to be probed, but they only uncover the information which the interviewee chooses to share. The use of psychometric tests enables interviewers to conduct better-informed competency-based interviews. Competencies describe the behaviours and skills required to do a job successfully. 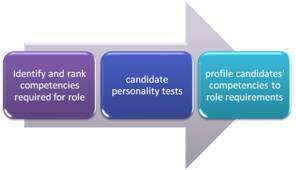 By profiling candidates against competencies, it is possible to gauge how they will react in particular situations. The benefit of this is that a much better fit can be achieved between the person and the job role. Sifting through a large volume of applicants is time consuming and can be arbitrary. Aptitude or ability tests enable unsuitable candidates to be screened out early in the selection process – saving time and expense at the assessment centre or interview stage. Personality tests enable the most suitable candidates to be selected in. They are powerful predictors of staying power and performance against factors critical to job success – especially when a competency-based approach is adopted. ¹ Aberdeen Research, Demonstrating the Positive Impact of Assessment on Business Performance, July 2010.